And so the sixth year of this fun thing I call the Twelve Days of Duckmas comes to an modest yet cute end. It's always fun to do this, though the past couple of years have been more difficult due to the lack of snow. Still, I hope it's been entertaining to you folks... and if you're looking for a more traditional version, head over to Quacked Panes, where friend GreyDuck has just completed his fourth year of "12 Days". We've got a decade's worth of holiday duck pictures between us? Who knew? Well. From my Flock to your family, we wish you and yours a Merry Christmas. We hope it's a good one. 1 Well, of all the adjectives one could use to describe my comic, I think this is the first time someone's used "traditional." In an annual tradition, the reinducks watch the 1964 documentary, Rudolph the Red-Nosed Reindeer, before the big flight. 1 Oh, I love this one! 2 Hah! Cleverly done, sir. 4 Cheryl, when the pictures came out of the camera, I started laughing for that same reason. 5 Where on earth did you get a 'Bumble? The Burpee black-diamond slope is officially open! Look at that starting drop! When you have snow, you also inevitably get snowducks! While I so want to call them Moe, Larry and Curly, I can't... that's too easy. So Tinker, Evers and Chance it is! Finally, the snow is back! On Thursday, we had blizzard warnings and there were some forecasts saying up to nine inches of the white stuff... and it happened! Well, to the northwest of us, that is. Here in Duckford, the weather nabobs claim we got four inches, and perhaps we did... in that particular snow cylinder. Out in the real world, however, we maybe got two inches, which is why you still see grass. However, without the snow, there'd be no way to get the crisp shadows in today's entry for the Twelve Days of Duckmas. Oh, and since we're all about traditions here at The Pond: "Eight wings! Eight freakin' wings!" 1 Better than "Sad Anime Girl in the Snow." Hmmm, just noticed that your Recent Comments widget is busted. 2 It's a glitch that occurs when large quantities of spam are cleaned out, Mauser. In my mind, this concept was a lot better than it ended up. "Ducklings visit Santaduck," that's a winner, right? Right. Oh well... maybe next year. 1 Hmm. Needs more lighting and more mall-type trappings? 2 I think Hans is a Santaduck. 3 I just happened to check wikipedia for 12 days of Christmas... According to them, the tradition is that the 12 days being with Christmas day (or the day after), and continue through January. I always thought (and in line with your 12 days of duck-mas) that the 12 days begin on the 13th, and extended to the 25th. Anyway, keep the ducks coming! I like ducks. 4 GreyDuck, at the very least. DK, it's a good thing that I'm not celebrating the 12 days of Christmas then, isn't it? Heh. 5 Any improvement on your knee? Did you figure out what happened? 6 Yes, and yes. It gets stiff if I stay in one position for long, but otherwise it's barely a trouble anymore. As far as what happened, I got into the DuckMobile. Why did it do what it did? Better question, and one I'm not able to answer... other than my knees are made out of razorblades and hate. 7 When I had my knee surgery, the doctor told me that knee actually has blood vessels in it, but the blood only flows through if knee is moving (weird, I know). Some pics I take to be artistic. Some I take because of the inherent beauty of the scene. Some I take because, c'mon, rubber ducks in snow. Then there's today's picture, which I took simply because it made me laugh. 1 "When you see it..."
So I did eventually make my way to the mall to take the annual "duck-at-Cvale" picture. Monday, it was. It was much less busy, and I was able to get a spot quite close to an entry. A casual walk to the center court, a few pictures, and I was out in about a half-hour, tops. Then I got back into my car. And the back of my left knee exploded like someone had hit it with a RPG. I had placed my foot against the firewall of the DuckMobile to adjust my seating position and pushed... and kaboom. By the time I got home, I was barely able to make it up the nine steps from the parking lot to Pond Central, and I was honestly worried about being able to get to work today. I slept quite poorly, since every time the knee moved, it hurt. This morning, once it loosened up, it seemed to move a little bit better than it had been... I was actually able to put a sock on that foot by bending my knee. Last night, I couldn't bend it enough to take the sock off, I had to use a spatula. I still stopped at the drugstore and picked up a cane on my way to work. Tonight? The cane helped me make it up the stairs, but I probably could have made it without it. Maybe I'm not as damaged as I thought! 1 "I used to be a Duck Photographer, but then I took an arrow to the knee." 2 Mauser? I haet yeu. 1 So I'm assuming those ducks won't be eaten? Gingerbread duck.... yum. 2 They're made of plastic. 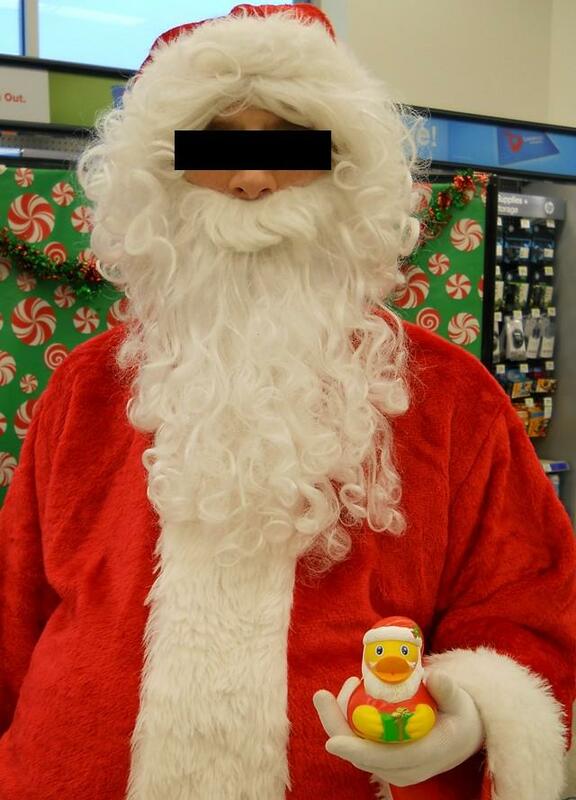 It's a first for the Duckmas photos today... an imposter appears! Clearly SantaDuck is the real thing! So here's the story behind this picture. I set out on Saturday to head to the local shopping mall, thinking it'd be busy but not so awful. I was wrong. I drove two laps around the mall parking lots trying to find a spot that wasn't a mile away from the shops I needed to hit, and failed. Then I realized "hey, stupid, we're ten days away from Christmas, why does this surprise you?" Disgusted with myself, I stopped doing laps and headed towards the nearest grocery store... and its parking lot was clogged as well, overflow from the mall. Now just disgusted, I pulled into a Walgreens for some bare minimums of supplies... just as the heavens opened up and rain gushed down. Now disgusted and wet, I walked in and was greeted by ImposterSanta. I did my shopping, ran back to the car, grabbed SantaDuck and took the picture. ImposterSanta seemed amused and I was relieved... still disgusted, still wet, but at least I got a Duckmas photo out of the excursion. They're saying we're to get some real snow on Thursday the 20th. I can barely contain my excitement. Wait...They've been wasting tax dollars on FAKE snow? 2 AWESOME! Well worth the trouble! Just as much a tradition as the "duckie in a fir tree" is the big bowl of Christmas candy for the Duck U students during finals week. Just part of what we do to help them through the stressful time, add a bit of holiday cheer to the proceedings... and just maybe find a photo-op or two. There is only one way to begin the annual event known as the Twelve Days of Duckmas, and that's with the traditional "duckie in a fir tree"! This is the fourth year running that I've used this particular duckie for the picture. There's a really good reason for that, too: he's cute and easy to work with! Tune in every day between now and December 25th for a new entry in the Twelve Days of Duckmas! 1 And so it begins. 2 Twelve Days of Duckmas! Eeeeeeee! I look forward to this every year! 39kb generated in CPU 0.05, elapsed 0.1726 seconds. 53 queries taking 0.1335 seconds, 174 records returned.